kki is a tall young man. He has silvery blue hair that becomes darker at the tips, it is styled somewhat messily. He has light blue eyes with a hint of lavender. Ikki wears a black spade clip on the left side of his hair, which keeps the hair on that side away from his face and tucked behind his ear. Beneath his left eye is a small blue spade. His clothing usually consists of blue and black color combinations. kki is a tall young man. 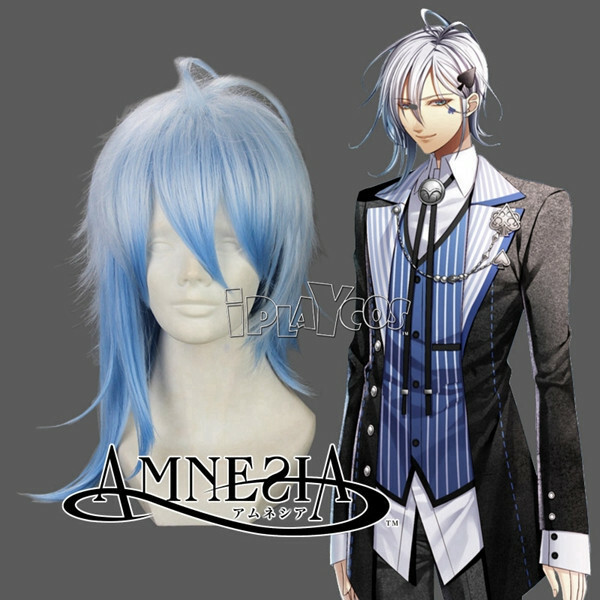 He has silvery blue hair that becomes darker at the tips, it is styled somewhat messily. He has light blue eyes with a hint of lavender. Ikki wears a black spade clip on the left side of his hair, which keeps the hair on that side away from his face and tucked behind his ear. Beneath his left eye is a small blue spade. His clothing usually consists of blue and black color combinations. When Ikki was young, he wished on a shooting star to become popular with girls, as he grew older he began to resent that wish, because he couldn't feel close to anyone due to his popularity. He dislikes his full name 'Ikkyu' due to bad memories of his past that relate to his name, therefore he goes by 'Ikki', although Kent continues to calls him by his full name. He is known to break up with his girlfriends after three months of dating, but it is later found out that they leave him due to his cruel fans harassment, and them making an agreement to take turns dating him for three months at a time. As each fan dates him they are supposed to write a daily report of everything they do with him each day. In episode 1, some of his fans stalked the Heroine and attempted to threaten her but she fainted.He doesn't know about that, but because of his girlfriends always breaking up with him, he decides to make three months the limit and date for fun, because he believes he can never fall in love, this also changed when he met the Heroine, he does not want to give up. He is very sweet and attentive. He is interested in the Heroine because she did not immediately fall for his gaze that is known to make women fall madly in love with him. He works at the same cafe as the Heroine, Meido no Hitsuji.